Russia’s bid for cooperation with the Trump administration in setting up safe zones in Syria could not have come at a less auspicious moment. Foreign Minister Sergey Lavrov landed with that mission in Washington Wednesday, May 10, in the middle of a firestorm over President Donald Trump’s abrupt dismissal of FBI Director James Comey and amid heated congressional hearings on charges of Russian tampering with the US 2016 election. Moscow is turning to Washington after coming up against major hurdles in getting its Syrian “de-escalation zones” off the ground. Its request for cooperation was first sent through back channels. One of those hurdles is the reluctance of Russia’s two co-guarantors, Tehran and Ankara, to put up army officers as monitors for those zones, DEBKA Weekly’s sources in Washington, Jerusalem and Amman disclose. Lavrov’s talks in Washington with President Trump and Secretary of State Rex Tillerson were to have been the first serious discussion on working together on the project, although he found the Republican and Democratic parties locked in a vocal dispute over the Trump campaign’s alleged ties with Russia before and after the presidential election. President Vladimir Putin and his army chiefs are keen on turning the projected safety zones into a political and military lever for renewing military cooperation with the Americans, with a view to halting the fighting on the ground and building a strong diplomatic tool for terminating the Syrian war. The Kremlin sees the way forward through amalgamating the Russian-sponsored Astana peace conference with the Geneva forum, which the United States has been promoting since the Obama administration. To this end, DEBKA Weekly’s intelligence and military sources reveal that Moscow is now willing to revamp its original plan for Russian, Iranian and Turkish monitors to supervise the ceasefire in all the proposed “de-escalation zones.” Moscow is offering instead separate deals for the zones bordering on Lebanon, Israel, Jordan and Iraq, in consideration of their extreme sensitivity for the United States and its allies. One such deal was presented at a meeting of Russian and Jordanian officers at the Jordanian-Syrian border, where large-scale US and Jordanian special operations, armored and attack helicopter forces are massed for the annual Eager Lion war game. 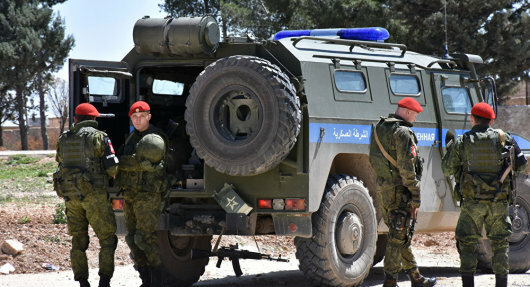 The Russians proposed that Jordanian military officers enter southern Syria, including the Deraa region, and assume the role of ceasefire monitors with responsibility for the southern Syrian safe zone. They would be backed by Jordanian military forces outside the Syrian border. If those officers came under attack, whether by the Syrian army or the Islamic State, those forces would be free to cross into Syria with US air support. Moscow crafted a separate deal for Israel, essentially pledging to cut out the presence of Iranian or Turkish military officers near its borders on the Golan and Mt. Hermon. On offer now are Russian officers as the sole ceasefire monitors at the northernmost point of the Israeli-Syrian border of Mt Hermon and the border intersection of Syria, Lebanon and Israel. Furthermore, Russia would initiate an expansion of the mandate of UNDOF (The UN Disengagement Observer Force) to include observer duties at the meeting point between the Israeli, Syria, and Jordanian borders.